Ever since mobile phones have become our de facto camera, the cost of taking a photo has plummeted. We are now taking more photos of the world around us than ever before. Photos have become such a crucial piece in the consumer app space that companies are basing entire strategies around them. And thus far, our love of nostalgia and our need for validation have been the guiding motivations behind the current state of photo apps. Nostalgia drives us to keep our old photos – whether in a shoebox or the cloud. We know that as our memories become more distant, we will value the photos of them even more. And with our hoarding instincts, not only do we want to keep all our photos, we want a reliable place to do so. Companies have realized this. It’s no coincidence that in a span of two weeks, we have seen a renewed emphasis on mobile photo storage. 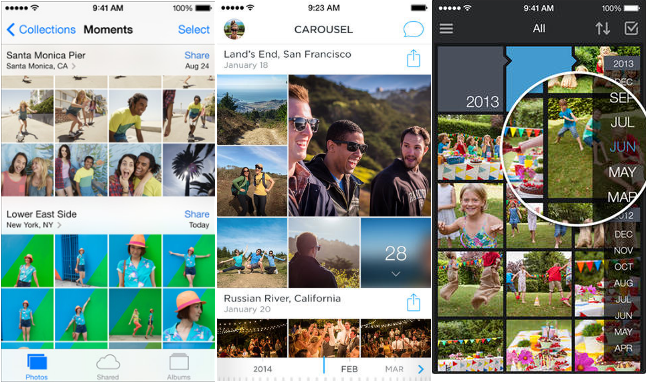 Dropbox launched Carousel and acquired Loom, Eyefi is now cloud-backed, and both Amazon and Flickr have revamped their photo apps. Our desire to preserve our memories is paralleled by our excitement to share them, ever since the days of cave drawings. By sharing, we implicitly seek validation. We expect a reaction in return. It’s this sharing-validation symbiosis that led to the explosion of photo sharing apps. Sharing is now easier and more creative than ever before. And each time we get a response to our photos – likes, hearts, or even a simple “awesome! !” – we get that little addictive hit of adrenaline. Facebook, Instagram, Snapchat and messaging apps ultimately play to our desire of validation. They continually optimize our ability to showcase as many of our photos to as wide an audience as possible. The recent incarnations of photo apps have focused on how we produce photos, and how others consume our photos. There has been little development on how we consume our own photos meaningfully. We still consume our photos in a very time-linear fashion, whether it’s through our camera roll or new apps like Carousel. This becomes ineffective as we amass tens of thousands of photos spanning decades of our lives. Our relationship with our photos needs to improve, and the next wave of photo apps will focus on meaningfully developing this bond. The sense of warmth, the sounds, and the conversations evoked by looking at the right photos at the right time is a powerful hook. Using the ever increasing amount of both personal and meta data available, these apps will tap deeper into our sense of nostalgia and become an indispensable part of our lives. The mobile photo space is far from “done”. It has yet to fulfill its potential, and I’m personally excited about its future.